Rota Ooh is one of the most challenging shrines in Zelda Breath of the Wild. The challenge you find here is called “Passing of the Gates”. In order to complete it, you’ll need to rotate the large gate and use its sides to reach the treasure chest and Spirit Orb. To make it easier on yourself, it is advisable to bring a few arrows. 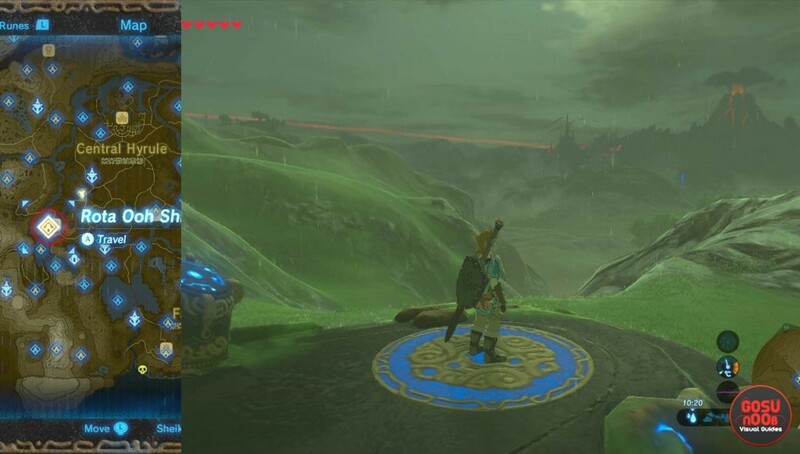 In this guide, we’re going to show you how to clear Zelda BotW Rota Ooh shrine, how to complete Passing of the Gates. If you head toward the southwestern part of Hyrule, the area called Gerudo Desert, following the the path from Central Hyrule, you’ll pass by the Outskirt Stable. Just west from it, on a hill above the stable, you can find the Rota Ooh Shrine. As soon as you enter, take a look to your right. There, above what looks like a metal basket, is an orange crystal. Hit it with an arrow. This will make the large gate in the middle rotate. Shoot the switch to rotate the gate. For the next step, be sure to pick up the ball that appears and bring it near the shrine entrance. Left from the closed door is a small passage that you’ll only be able to reach when the gate is in this position. Head that way and loot the Small Key from the treasure chest at the end of the path. Get back to the entrance, and hit the crystal switch once again. Move the ball, grab the Small Key. Now, we’ll need to use that ball. Throw it into the metal basket, just under the crystal. Use the key to open the gate, step back and shoot the crystal. The large gate will rotate again, making the ball fall onto the switch behind it. This will activate the platform at the center of the room. After the second gate rotation, open the doors, put a ball into the metal basket, shoot the crystal. This fast-moving platform is vital for the next step. Stand on it, and it will propel you into the air. While in the air, look for the Treasure Chest on the small balcony. It might take more than one try to glide toward it. There is a weapon called Feathered Edge (15 damage) inside. Right from the treasure chest balcony is the Spirit Orb platform. To reach it, you have to rotate the large gate one more time. To do so, you can for example use the boost from the moving platform to get into the air, shoot the switch and wait for the gate to turn around. If you don’t have enough stamina to remain airborne until gate rotates, go to the switch, place the bomb close to it, jump down toward the other side of the metal basket and activate the bomb. The rotation of the gate will help you find yourself on the top of it. This time, the passage to the Spirit Orb and the end of Rota Ooh is open. Use the push to reach the Treasure Chest. One last time rotate the gate to reach the Spirit Orb.